I think the only other way you'll be able to learn support/healing Blue Magic will be to confuse an enemy, and I believe the only way you can do that with your party is to equip someone with a Dancing Dagger (which you can't get until the Moogle Forest), hope that it casts Tempting Tango, and then hope that the enemy in question casts the right spell on the right party member. 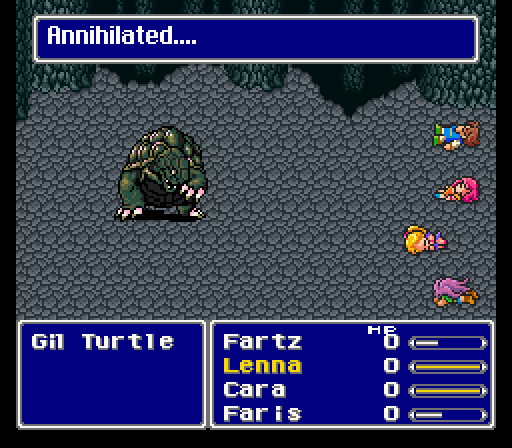 I decided to try to take on the Gil Turtle, because I'm a masochist idiot BRAVE HERO. What an awful fight. For starters, Zeninage does a whopping 0 damage, so if you were hoping (as I was) that the fight was easily cheesable by a Samurai, you're wrong. Its physical attacks remove about 2/3 of my characters max HP, and it counters every attack with a special move that deals damage similar to its regular attack while also inflicting a slew of status effects (and it hits two of your party members each time). The strategy I ended up using was to equip my party with evasion-boosting items like Elven Mantles and to move them all to the back row. 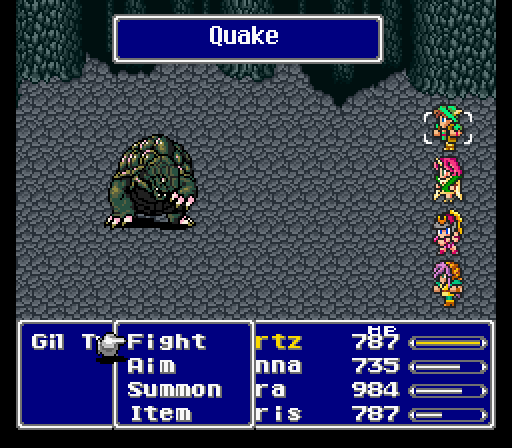 I would cast Golem to protect my party against the Gil Turtle's attacks, and I would damage it exclusively by using Hi Potions on it, which hurt it since it's undead (and no, Elixirs and Phoenix Downs do not allow you to cheese the fight either). Since it would counter every Hi Potion with it's one-two special on top of its regular attacks, I would have to recast Golem frequently (my stony buddy could take 4-5 hits per cast). And every now and then the boss would get a hit through, leaving me scrambling to try and heal up my now poisoned/paralyzed/blinded/aged party member(s). (!Animals was useful thanks to Nightingale healing both HP and status effects, but it only had about a 2/5 chance of coming up.) And since Hi Potions only dealt 500 damage per use out of the GIl Turtle's 32,768 HP, combine that with all the healing, summoning, defending, and MP restoration I had to do... well, I had a long **** fight ahead of me. ...and then everyone died because Quake dealt over 3000 damage apiece, and I had no Blue Mage, Time Mage or Chemist to cast Float on my party. Carbuncle had some strong attacks, but was slow enough that I had plenty of time to heal. 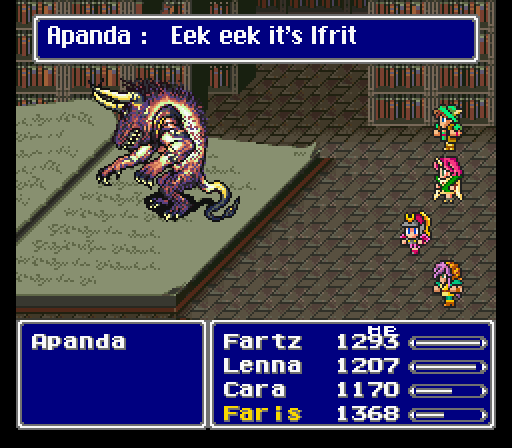 I mainly relied on physical attacks to damage it (!Rapid Fire was very useful since it got around Carbuncle's high evasion), and the fight was over pretty quickly. I get the feeling Carbuncle is going to be a very useful summon, considering I have no White Magic to complicate having Reflect on everyone. Gilg was a pushover. The only issue was trying to keep everyone free of status ailments. Golem and Carbuncle were crucial here, though I had to recast them frequently. Most of the damage I was doing came from physical attacks, with the odd summon here and there. The first time I fought him, he wiped out my entire party with a single cast of Lv. 3 Flare, so I spent a little time grinding everyone to a safe level before trying again. Once I did that, it ended up being a fairly easy fight. Kat - 1. Thief 2. Summoner 3. Bard 4. ??? ^I hadn’t thought of that Tempting Tango strategy. That could work, with some patience. Just completed Drakenvale. My party is good at dealing damage quickly. I did wipe once, at Gilgamesh on the Big Bridge. So I think my count is up to 9? Antlion was easy. I pretty much just held down the A button for that fight. 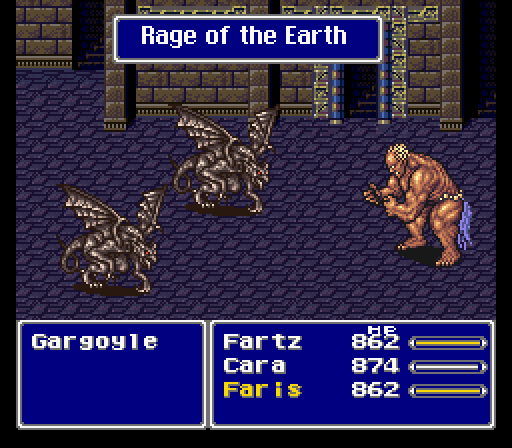 The Gargoyles were sooooooooo much easier compared to last year, due to the simple fact that I have multi-target offensive spells. Thank you Summoner! 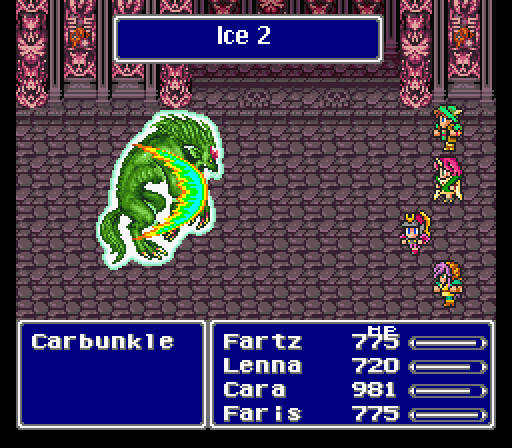 For Melusine, I simply summoned Carbunkle to reflect her spells back at her, and used Rapid Fire to power through her defenses. 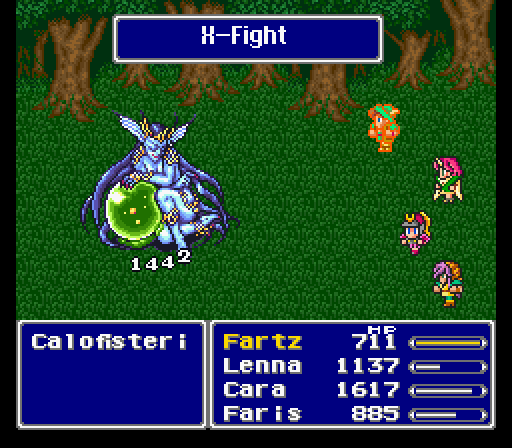 The fight wasn't very difficult, even with Melusine healing herself. - I went to the Pirates' Hideout and grabbed the lightning wind-elemental Syldra summon. - I went into the Sealed Castle and grabbed my first three legendary weapons: the Masamune for my Samurai, Yoichi's Bow for my Hunter, and the Magus Rod (boosts all elemental spells by 50%) for my Summoner. These may end up being the only legendary weapons I get. - I went to the Phantom Village and purchased the best armor money could buy. I also bought four Coral Rings, which will be extremely useful in some of the boss battles to come. And now that there's nothing left to buy, I can Zeninage to my heart's content. I have four summons left to gather (Odin, Leviathan, Bahamut, and Phoenix). Once I get them, I'll probably head straight for the final dungeon. I decided to try Bahamut first, because I'm an idiot. Ha ha. I went and grabbed Phoenix instead. Much easier. I never found all the summons in either of two play-throughs of this game, so I'll have to look those up. Did some work on my long flight yesterday. I tried doing the Crystals fight "fairly" and got completely demolished...so I cheesed it with Zeninage. ¯\_(ツ)_/¯ I just defeated Carbuncle, which will be extremely useful for me. Gonna finish Exdeath's castle later today, hopefully. BUTTS: Samurai w/ Dual-Wield. His Attack command will be pretty bonkers. Won't be able to heal himself, but I've decided that's fine. I'm willing to grind for money to buy healing potions. LENNA: Summoner w/ !Blue. 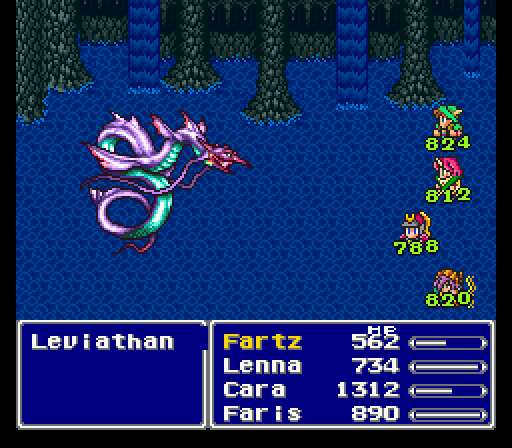 I think this is the best way to harness Lenna's natural magic stat, which is the highest of the 5 party members. She'll also be able to heal herself readily, as well as deal any offensive magic that I have. KRILE: Blue Mage w/ !Call. I've equipped the Gold Hairpin on Lenna, so I think having the MP-free !Call command will be useful. It's random, sure, but the number of Summons that will actively harm me is pretty low. FARIS: Ninja w/ Equip Katanas. This means that Faris and Butts will basically have the same potential load-out, but they will be hitting like trucks every turn with simple physical attacks. I can also equip !Smoke for portions of the game, like I just did in Exdeath's Castle because those dragons are terrible. Wiped two more times to random dragon encounters in Exdeath's Castle, so my count is up to 11. ^Right, but it’s hard to acquire without a Beastmaster. I’ll pick it up eventually, but it will take some doing. Odin was easy, but I still ended up cutting it close. Everyone's capable of doing great damage at this point, so I just kept on him and beat him with one second to spare. So, my plan was to complete no more tablet dungeons than necessary. The only one remaining that I really need anything from is Istory Falls, which houses Leviathan. However, in order to reach Istory Falls I need the submarine, and to get the submarine I need to enter the Catapult, and to enter the Catapult I need to complete the Fork Tower, and to open up the Fork Tower I need to go through the Island Shrine... So, looks like I'll be doing three out of the four tablet dungeons. This fight was just tedious. I had no problem keeping everyone's health up, so it was just a matter of playing the shell game with these guys until they went down. For the Fork Tower, I sent my Summoner and Thief into the magic tower and my Samurai and Hunter into the physical tower. Minotaur wasn't too difficult, since I was able to heal any damage he dealt with Hi Potions. 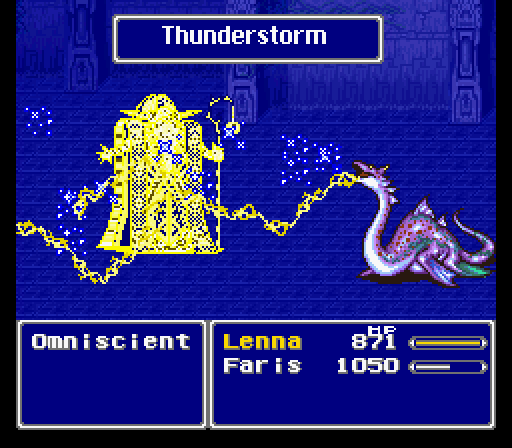 Omniscient was also easy: Carbuncle deflected all of his attacks, while Syldra dealt enormous damage. 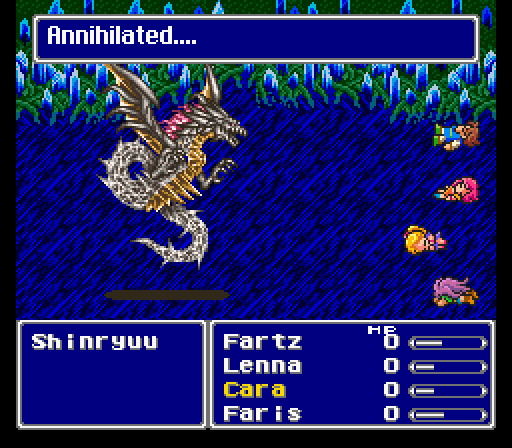 The only danger was the short period between Reflect wearing off and me recasting Carbuncle. Having four Coral Rings made Leviathan so easy, I almost felt bad. Golem blocked Leviathan's physical attacks and the Coral Rings basically gave my party a full heal every time Leviathan cast Tidal Wave, meaning I could focus on using Rapid Fire and summoning Syldra. Bahamut was still a tricky fight. Golem, Carbuncle and the Coral Rings negated most, but not all, of his attacks. I had to start dipping into my Elixir collection to keep my party alive. 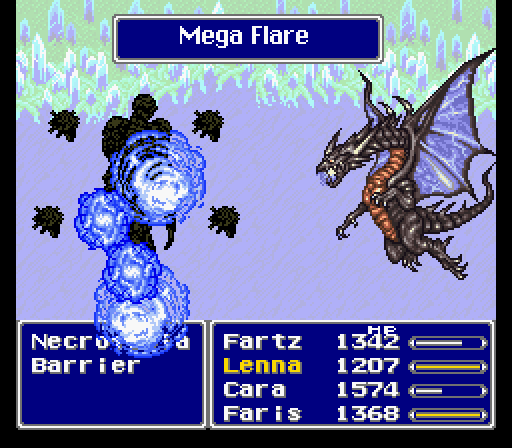 What saved me in the end was the fact that Mega Flare can be reflected, something I wasn't expecting at all. And with that, I now have all of the summons in the game. To the Interdimensional Rift! I didn't do much grinding, but I did get everyone to level 35-36. I also swapped out my Summoner's !Animals for !Call. The only animal I really hope for is Nightingale, which gets less likely to come up every time my level increases. At least with !Call I'm likely to get something useful. My only major fear heading into the final dungeon is being able to heal. I stocked up on Hi Potions and Phoenix Downs, and still have a lot of Elixirs/Ethers/Cottages as well. I also have Phoenix, which revives a person with full HP and MP. So it'll be tricky, but I think if I'm careful I should be fine. Calofisteri was easy. I killed her with physical attacks while she was still trying to cast Reflect on everyone. Apanda was another easy fight. Ifrit kept it tame while I wailed on it with physical attacks. Hell, all of the bosses were easy. Carbuncle reflected most spells, while physical attacks and Odin/Leviathan/Bahamut dealt tons of damage. Twintania in particular was a joke due to the Coral Rings. Man, why couldn't Omega have been this simple? After all the trouble this boss gave me last year, it felt sooooooo good being able to take out all four Barriers before they could even attack. 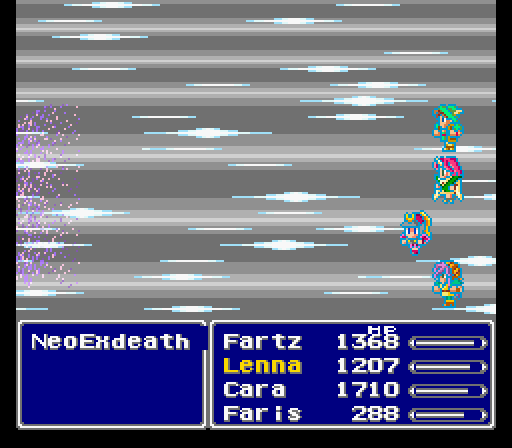 No time for an extended post but I should mention that I beat Exdeath and am now in the merged world. Trying to figure out where to go next. Will probably just copy what Val did for his Summoner side questing route. I had a bad party comp for Melusine, so that battle took me like legit 20 minutes to finish. Maybe more. I’ve wiped twice more, both to silly random mobs. Not having all 4 of my party members was really crippling to my strategy. -Wendigo was just annoying, not difficult. -Minotaur was mincemeat. Dual-wielding Samurai and Ninja just completely destroyed him. I also have Hermes Sandals on Bartz, so he is just really plowing through things. -Omniscient was annoying because of !Call sometimes having physical properties. 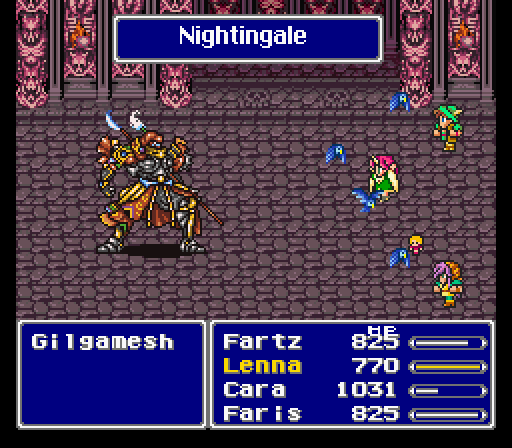 I ended up just not using !Call after two tries, because Chocobo Kick, among others, would trigger Return. Once I started using Aeroga (forgot how amazing Aeroga is btw) it went fine. -Leviathan was very simple with Coral Rings. -Beat Odin with 22 seconds to spare. -Bahamut wiped me once, but the second time was a complete breeze. Just got unlucky rolls the first time. -Calofisteri took a while, but never truly threatened. -Man, the Rift music is so good. -I FINALLY GOT WHITE WIND. The energy orb guys in the Forest section of the Rift are the first White Wind-using enemies I’ve encountered since getting the Dancing Dagger. Took about 10 minutes to finally get the magical combination of Tempting Tango-White Wind, but I FINALLY have a multi-target heal spell. 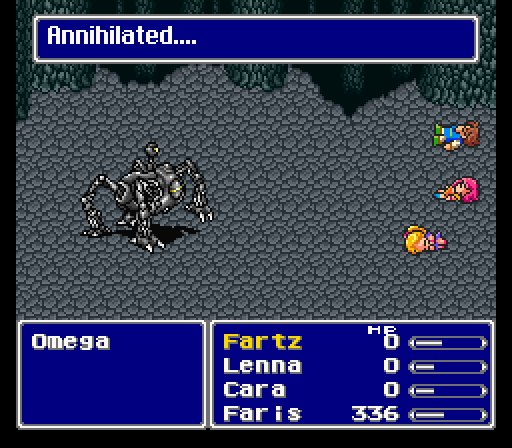 -Accidentally ran into Omega and wiped. I wiped three more times—once on a Jura Aevis (stupid wizard dude encircled three of my four party members...), once in Twintania (forgot to equip my coral rings) and once on Necrophobe (forgot the barriers had Reflect). But I have conquered, and now it’s on to the Big Boi himself. Should finish tonight. That’s all, boys and girls. Really happy with how this last battle went. I practically dominated. I killed the bottom section before it could even cast Almagest once, so basically my entire fight was just dealing multitarget damage and trying to mitigate/repair the effects of Grand Cross. Krile got silenced, so I had to let her die and then revive her with Phoenix, but that was the worst it got. 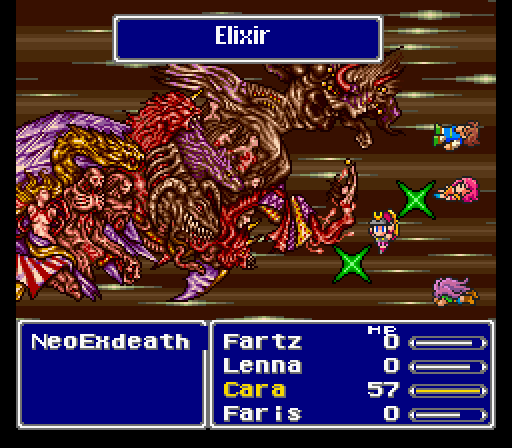 Lenna got Doom’d from Grand Cross, and she died moments after delivering the second-to-last attack (a Bahamut summon that killed two sections of Neo Exdeath). Again, my MVP ended up being dead as I finish the game. Whoops. Overall, this party was not as interesting as last year’s, but that’s not necessarily a bad thing. Things were more straightforward, which was enjoyable on its own. I still think it’s amazing that this game is so well-balanced that any combination of four jobs, even four Berserkers, can take you through the whole game. Glad we got to do this again! Here’s a poorly-taken picture of my final party. ^ Nice job! It looks like you had a pretty good party all things considered. So, I gave it a shot... and didn't last very long. The Coral Rings definitely helped protect against Tidal Wave, but every other attack in Shinryu's arsenal would obliterate my party. I miiiight have been able to do this if I'd been able to equip anyone other than Krile with an Ice Shield, but as it was I had no way to stay alive for more than a couple turns. Once again, no bonus boss swag points. That just leaves the final boss then. 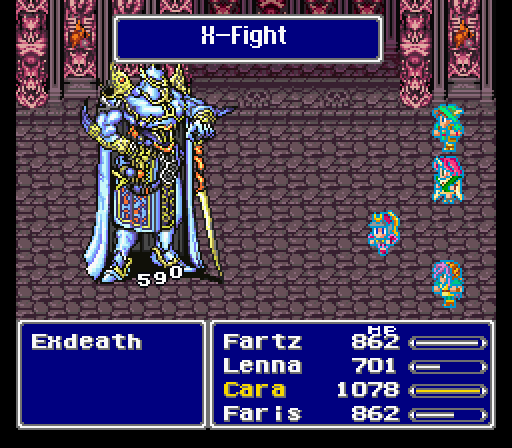 Exdeath's first form was very easy to deal with. 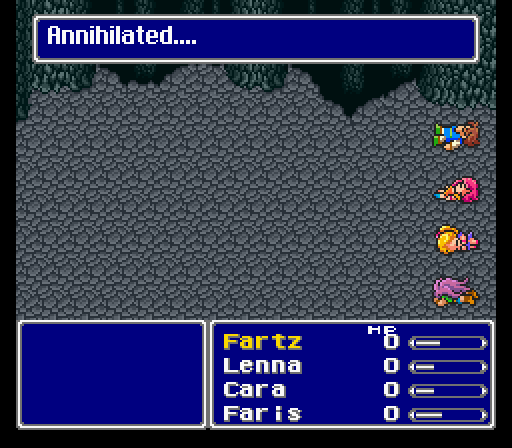 Carbuncle and Golem protected my party, allowing Fartz and Krile to attack and Lenna and Faris to heal. After that it was on to the real **** show. I initially focused my attacks on the middle part of the boss to prevent further casts of Almagest. 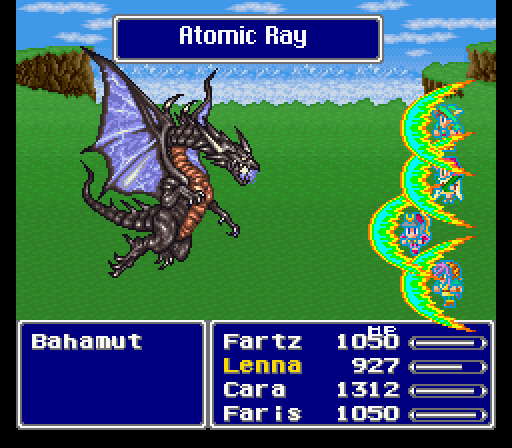 After that, !Rapid Fire and Bahamut did the work for the other three parts. I enjoyed my run this year. It's hard to say whether this party was easier or more difficult to run with than my previous one. In some ways, it was easier: I was capable of dealing a lot more damage, and spreading it out over multiple targets. On the other hand, my biggest weakness was my lack of healing abilities. To the end of the game I was still relying mainly on single-target items to heal my party, and although Phoenix was extremely helpful for reviving fallen party members, it didn't make up for a multi-target healing spell. Compared to last year, battles were ending much quicker, whether through victory or loss. Thief ended up being the most disappointing class. While Steal got me a few nice items early in the game (and the Genji equipment from Gilgamesh), and being able to run outside battles was a huge quality-of-life improvement, it was the weakest job in battles, with poor defensive capabilities and low damage output. The other three classes were much better. Summoner was extremely versatile and powerful. 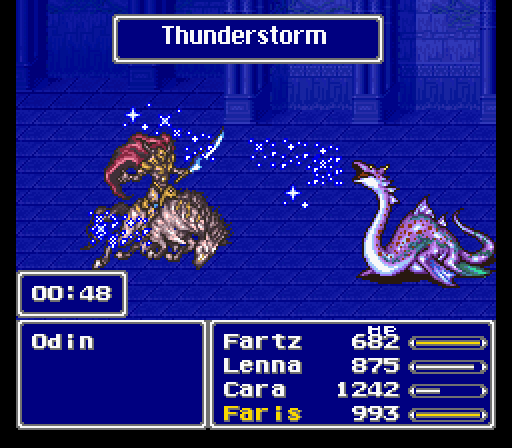 Carbuncle and Golem were indispensable, while Odin, Phoenix, and Bahamut made a lot of difficult battles much easier. !Call was surprisingly handy, since it consumed no MP and had a very low chance of casting something completely useless. Samurai may not be the best physical fighter in the game, but I thought it was decent in my party. !Zeninage was good for dealing spread damage once I no longer had any use for money. Katanas were great weapons simply for their ability to perform critical hits. And I'm glad I had someone who could wear decent armor and tank hits. That was a lot of fun. I'm looking forward to doing this again next year. Nice work, Val. While my Samurai ended up being my primary source of physical damage, I feel like that was only the case because I had him Dual Wielding from the Ninja job. I wonder if I would have enjoyed him as much if I just had him equipped with a katana and shield, especially because I found most of the Samurai !Abilities to be pretty bad. Did you equip !Rapid Fire on your Samurai, or Thief, btw? I feel like if I ever rolled Ranger I would slap that sucker on every physical attacker I have. I gave my Samurai !Rapid Fire, while my Thief had !Summon instead. 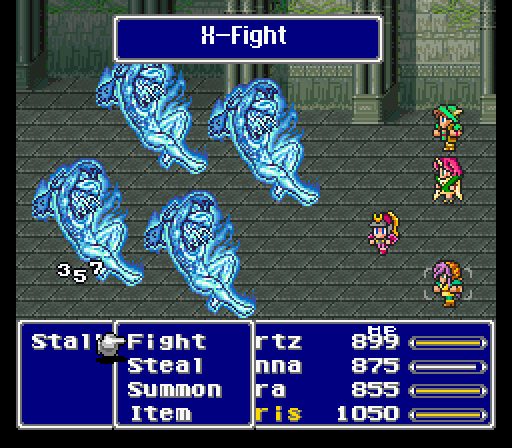 I felt like having an extra Summoner would be better than having a weak third fighter. !Rapid Fire would definitely be fantastic on just about any physical class though. Now I have time to play and have wiped on Archeoavis. I just have no idea how to make my party be. Considering Job Fair. Bard is not that compatible with Summoner imo. Thoughts? You’ve got a tough roll right now, Kat, not gonna lie. I think Bard + Summoner will be very powerful near the end game when you have your stronger summons and your more potent bard songs. Right now, though, I can sense your trouble. You could make it through if you grind a little, until you reach the point when you can break the game open a little. But. If you’re not having fun, re-roll. That’s what’s most important. If I were you I think I'd grind a bit and try to power through Archeoavis just to see what the Earth Crystal job will be. Other than that, I'm not sure. Do you have all the songs/summons available up to this point? I can't remember if you can learn Mana's Paean now or only in the Merged World, but it seems like it'd be extremely useful for Summoners. ^Merged world only, on the roof of the Library of Ancients. Make sure to learn it before it, you know, disappears. But still, if you can grind through until that point, that spell would have a lot of great synergy with your Summoner.